Yesterday, we returned from a pleasant lollygag by a cool river in Austin to find a terrible, terrible smell emanating from the rental car. We hurriedly unloaded everything in the parking lot until we found the culprit — faulty wiring in the trunk’s light had created sparks, igniting a smoldering fire. Imagine the relief when we found the damage was limited — and the hilarity when we realized where it had been done. 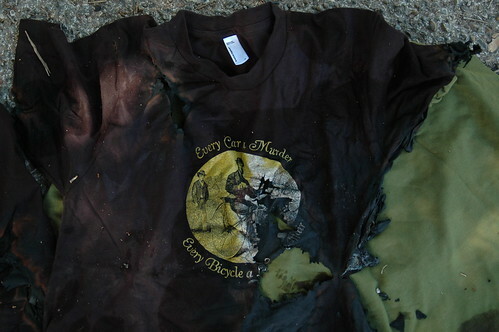 The trunk was packed with books and merch and our personal belongings, but the only items destroyed were half a stack of the t-shirts that read “Every Car A Murder, Every Bicycle a Love Affair.” These tees, designed by Joe, have been alternately delighting and scandalizing event attendees and passersby since Oakland. Certainly nobody responds neutrally to them — and now even the car has chosen sides. The situation could easily have been much worse in so many ways. Fingers crossed that this will be our worst mishap of the tour. It’s hard to imagine a funnier one.